Rated 5 out of 5 by TubularGames from A FANTASTIC ADDITION TO THE DARK PARABLES SERIES This series just continues to get better, this CE has smooth and engaging game play throughout, with challenging (but not impossible) mini-games and an interactive map that is great for transporting between scenes and helping track collectables. It is good to see old characters again and help them fight evil once more. The Extras section in this CE ensures you get great value for money - for if like me you happen to miss a particular collectable or parable picture during the main gameplay there's no need to panic. This is because you can revisit any scene and seek out the relevant missing item, meaning for the casual BF game player you can still complete all the challenges and fill the all important achievements board. This is an excellent series and is suitable for all gameplayers regardless of skill level or experience. So if you are looking for hours of brilliant gameplay try this superb CE. Rated 5 out of 5 by alwaysplay from Give it a gold star ! I own all the Dark Parables games, and none of them have disappointed me. And this didn't either. This game was very exciting, I played this game at one sitting. I couldn't stop till I finish the whole game, loved it, love it, bought it. Rated 5 out of 5 by Dustfall from Excellent Game This game is wonderful to play and makes you lose track of time. Excellent story and game play. Join the fun and play. Rated 5 out of 5 by ginabinadoll from Excellent new addition to Dark Parables I was pleasantly surprised at the quality and fun factor of this game. 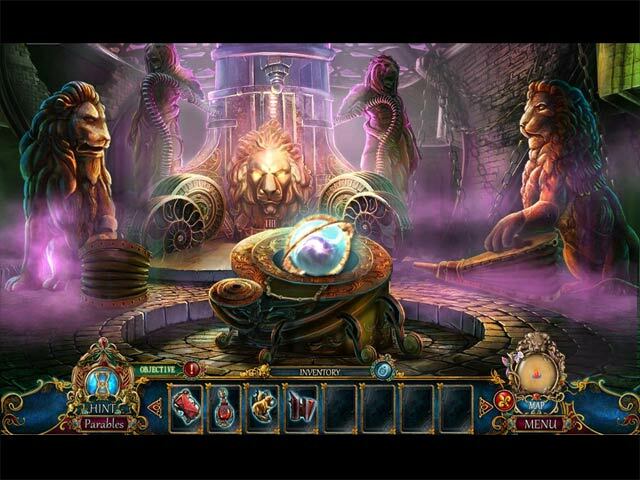 I know many of us who love the Dark Parables games were disappointed with the last one after Eipix joined Blue Tea. But I truly feel that our voices were heard and Queen of Sands is now one of my favorite Dark Parables game. Rated 5 out of 5 by GordanaG from Simply Amazing! I finally finished the game and I'm still super excited! The whole game is more than awesome. Everything! The scenes, characters, mini games, especially puzzles, an entire artwork...simply amazing and more than beautiful! I think that this is my new favorite game. Keep making this masterpieces, you're getting only better and better. Rated 5 out of 5 by NAVEMAN3 from The First of the Beauty & the Beast case Though this story of beauty and the beast, doesn't have other legends like Cinderella, I can see that this first Beauty and the Beast story is a good one and it is well made. We again work with the Red Riding Hood sisters but this time we meet a new member. It's your job to stop a corrupted Sandman, or Queen of Sands if you will, from turning the townspeople into living nightmares. There's no enchanted rose, the hourglass is basically a symbol of 'time is running out'. Oh and we do have a helper in this game like before. Here is my hint: As a woman I love crystals, though I never look in the mirror, but my sword always reigns true. Visual: Less is more when it comes to detail and it doesn't fail me. 10/10 Mood: Suspenseful in everyway. 10/10 Music: Matches the mood to a T. 10/10 Voice-acting: It matches all the characters but there was one that sorta gave away on the old lady. But I'm blaiming it on a bad mic. 9.5/10 Story: Stop complaining about Eipix. Yes I know there's no other Beauty and the Beast stories but have you ever though that this might be the very first one? 10/10 FROGS: Well not all things are too small for me to see, but it does take time to find them all. 10/10 Puzzles: Had to skip a couple cause they were too hard. BIG PLUS!! 10/10 Replayvalue: 0/10 Bonus game: In the past we don't see any connection from one bonus game to the other. This one does. Not only it's a prequal to the main story, it also connects to 'Hansel and Gretal' before it even happens. Yeah there's no spider but the good thing is, this tale of the fable makes more sence the actual fable. 20/20 Added points: Achievements: Less is more so no rediculous ones to find. Keep that up Eipix. 1/1 Bonus video: For those that love 8-bits you're going to get a good laugh. 1/1 Collections: Don't worry about not finding all of them. This time, and probably the first time Eipix ever did this was that you can click back, if there's an empty circle, and go back to the scene and find the missing collector. 1/1 Before the grade was 89.5 but with my bonus points it's now up to 92.5 a perfect A and no powerstruggle this time. It's now a 50/50 of both BlueTea and Eipix. And I ask again fans, please stop blaming Eipix about sharing DP with BT. I honestly think they asked them to help is to that Eipix can polish it so there won't be bugs. You have to admit there were some in the old games before. This is is my gade and here's my hint for DP10 and I this will make you laugh once you know what it is: In the very earliest editions of this fairytale, the home intruder gets punished by it's 3 inhabitants all because she ate their food, broke their chairs, and didn't made the bed. Rated 5 out of 5 by 1955raven from A PURE DELIGHT!!! SO LOVELY,MY WISH IS FOR MANY MORE DARK PARABLES TO COME! DESERVES 5+ STARS! Rated 5 out of 5 by flutterbyz24 from A New Twist on the "Sandman" I am, for the most part, a huge fan of the Dark Parables series. I have my favorites and my not so favorites, but I have enjoyed all of them. I particularly like FROGs - putting something together for its use is more fun to me than finding random items that have no bearing on the story. As with most Dark Parable games, some of the mini-games are easy, some are more challenging, and some are rather tedious. That's why I love the skip button. Is this the best ever Dark Parable. No. Is it the worst in my opinion? No. Are there games out there that other Fishies rave about and I hate? Oh yes. Definitely. For me, this is my kind of game. It may not be the best Dark Parable out there, but it is so much better than a large proportion of the games that have been released by BF lately. Rated 5 out of 5 by SparkleGlow100 from Love it! I absolutely love this game. It has gone back to the high standard of Dark Parables: The Last Cinderella as far as I can tell (I also loved Dark Parables: Briar Rose, and Dark Parables: The Exiled Prince). I love the Hidden Object style where you create objects in three different sections after finding the individual parts. And BEST OF ALL everything, whatever they may be, is ornate and spectacular. The sound, the story, the atmosphere, are all great. Thoroughly enjoyable. Thanks BFG, Eipix and Blue Tea Game ! Rated 5 out of 5 by dandb from Another beautiful Dark Parables game. This is a visually stunning game, no surprise there! It plays quickly, not too much back and forth. Very good. Rated 5 out of 5 by dellinindyp from Top Quality at its best I have every Dark Parbles game that has come out. and you never fail me. the quality of the game is the best, the morphing was super because you have to be on your toes..to see it. the picture quality fantastic as always. I love anticipating what's in store next from one level to the next I loved it.. challenging also not a boring moment. Rated 5 out of 5 by jazzytia from Queen of Sands Awesome.....I loved it. I love this series. Rated 5 out of 5 by sandradolores from Out Standing 5 stars for everything. Blue Tea did it again! Absolutely gorgeous game filled with great games and lovely HO's especially when having to find parts of items. Loved their new map. Greatly improved since previous ones and this one will allow you to teleport. 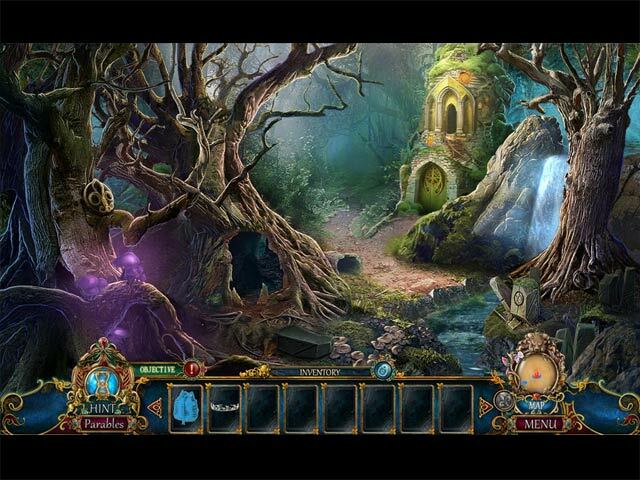 Hidden objects to find, good voice quality, challenging, and nice story line. I do think this one might be especially hard for a beginner. I can find no faults with this game! I highly recommend this game as do I for all of those developed by Blue Tea. Rated 5 out of 5 by PirateGirl212 from What a wonderful game! I enjoyed very second of this game great storyline, Frogs and puzzles. I'm glad that Eipix has taken over from Blue Tea Games and continued the series I'm also glad that Eipix put more of the Blue Tea Games effects like the chapters coming up. I only wish they put the FROGS into the SG so people can find the pieces more easily instead of using hints. Rated 5 out of 5 by RoboWarrior from Too Enjoyable! The game has beautiful graphics, and I feel it's quite challenging. I miss the music quality from the earlier DP games though. I thought the DP series was over after Little Mermaid and the Purple Tide, but I was excited and happy to see another DP game!. Rated 5 out of 5 by Paintedspoon from Beautifully done! Others have stated the details so I'll pass on that. This is a lovely visually beautiful game. It's also great to see the HO scenes done this way again. The items are well hidden and to me that makes it more of what a hidden object scene should be. The artwork that goes into these games is astounding. The glitch of the recorder in the beginning "What a HOOT" I wonder if they were seeing if anyone was watching?!! Have a try you might find it fun too. Rated 5 out of 5 by LogieBaby from Why the consternation about the developer?? Some of the reviews lament the fact that Eipix has taken over Blue Tea Games. I don't think this is the case at all. To me, Eipix is now the distributor of the Dark Parables games. I own all of the prior DP's and Queen of Sands does not appear any different in style or substance. One need only to go back to any of the earlier games to ascertain that Blue Tea remains the driving force behind these brilliant HOPAs. Eipix in the past couple years, while creating magnificent efforts in its own right, has also become a driving force as a leading vendor of other developer product. As to Queen of Sands itself, IMO it stands as another solid Blue Tea creation. 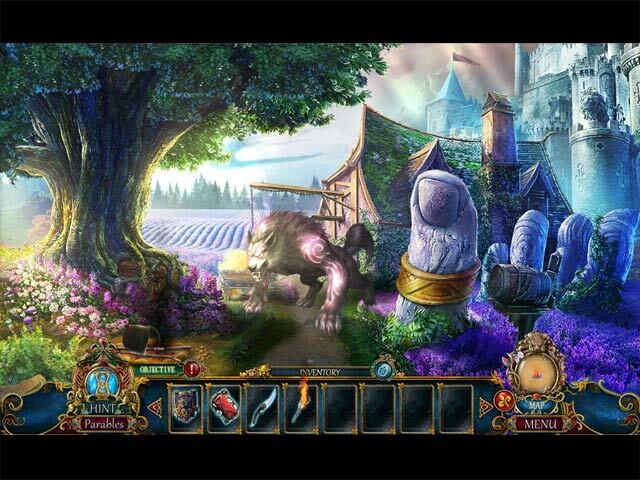 We play as the detective assigned to the town of Montrafleur in the French Provence. The evil Queen of Sands has transformed otherwise benign Sandmen into monstrous creatures performing nefarious deeds at her beck and call. With the assistance of the Red Riding Hood Sisters, our task is to vanquish the queen and save the town. As with the prior DPs, this is another FROG style game. I found that some of the fractured objects to be somewhat harder to find and that's a good thing. The puzzles range from very easy to challenging ( at least in the demo ). The items created in the FROG scenes are as always stunning. Some items are merely picked up as the detective travels throughout the town. Certain items need to be combined with other parts while some stand alone. There are collectible fleur de lis and morphs which decipher the parables. This game does nothing to diminish my enthusiasm toward the series. While some series have gone downhill over the years, including BFG's own MCF games, Blue Tea continues to be a master of its craft. So folks, kindly refrain from the flap concerning the partnership with Eipix. It's overblown. Rated 5 out of 5 by mareflynn from Very Enjoyable!!! It holds my attention and the graphics are beautiful! Rated 5 out of 5 by biscuitsmama from A COLLABORATION BETWEEN THESE TWO TOP DEVELOPERS HAS GIVEN US A GEM FIT FOR A QUEEN Yes, Detective, once again your help is needed since strange events are occurring in the village of Montafleur, France. Not only have you been called in to investigate, it looks like you will join forces with your old friends the Red Riding Hood Sisters who are currently in the region. Gosh, I hate to say it but the graphics in the beginning of the game seem so cartoonish that I am afraid they might be a put-off for many lovers of the Dark Parables games. Fortunately, that flat look doesn’t last long and things improve quickly. I have always loved the Dark Parables games and their developer who offers slightly tinted tea, so I was a bit disappointed to learn that the series is now a joint effort with another top developer. After my initial disappointing reaction to the last DP game, I quickly learned that this is indeed a “match made in heaven.” These two developers have combined the best of their creative teams and now bring us the new DP games that, IMHO, are technically improved while still maintaining the artistic genius of the series. One of the best things about the new Dark Parables games is that the map works. I rely on the map when I get stuck and can’t figure out where to go next and it is a joy to have a map that functions as it should and that allows me to effortlessly skip from scene to scene. What would a Dark Parables game be without those wonderful FROG scenes? The only thing I miss is the opulence and richness of the FROGs in the earlier games in the series. A bit of the luster has disappeared but in some respects it is a bit easier to spot the fragments needed. Many of the puzzles are a departure from the norm and I found one or two to be a bit more difficult but still doable. If you like all the extra goodies in the CE games, you will find them in Queen of Sands. IMHO, there are plenty of collectibles to find and don’t forget to look for those parable pieces that will unlock mini parables as you progress. The Dark Parables are always wonderful games and I own them all. I have been eagerly awaiting the full release of Queen of Sands and it doesn’t disappoint. Just as I was getting into the game the demo ends with a cliff-hanger so, of course, I had to hit the buy button. These two terrific game developers have presented a game with an excellent storyline and all of the features that I look for in my games. Although, many may disagree with my love of the Dark Parables games, I believe they are some of the best games to be found. Even though I rushed to buy this wonderful gem, as always, I recommend that you at least try the demo to see if this is a game you will like. Rated 5 out of 5 by pennmom36 from Shackled By One Man's Dreams I have always been a fan of the Dark Parable series, purchasing each and every parable that was released sight unseen.....until everything changed including the devs. Dark Parables has always been a nonlinear type game, where an action in one scene activates a feature with a previous scene. DP are famous for their clever Morphing Objects, and they were difficult to "see" because you had to complete an action in one scene and then return to previous scenes to look for the Morphs, but you never knew which action would actually trigger the reaction! Dark Parables are also famous for their FROG's, beautiful scenes with fragments of three sections of an item that will combine to complete a single inventory item. This part hasn't changed, but the music that accompanied each fragment found has changed, and I missed it dearly, it was a recognizable and distinguished sound. Queen of Sands is an excellent game, but it just doesn't feel like a Dark Parables game because the devs are straying away from all the features that made DP such an enjoyable series. Collectible Parables are another famous feature of this series, several items are required to complete each parable story. When a group is complete, you will get to play a short tale about that parable. The parable items can Morph, so keep alert. There are collectible Herald of Montafleur's, hidden throughout the game, for a total of 39, one in each scene. This Collector's Edition also has 12 Achievements to earn, mostly the usual achievements such as using the map or finding objects quickly in the FROG's. Dark Parables is all about the Emblems. Every door, and just about everything else will require at least one emblem to open it. Therefore, you will scour each location looking for the correct emblem, often traveling back and forth several times as you try to accomplish each objective. Several inventory items are plus items requiring you to combine that item with another item or putting broken pieces back together. This Collector's Edition has Concept Art, and Wallpapers (within the Art Gallery), replayable Mini Games and FROG's (play against the clock for a better score) collectible Parables (morphs), collectible Herald of Montafleur's, a Souvenir Room, Bonus Video's, Movies, beautiful Music, Achievements, a built in Strategy Guide and a Bonus Chapter (The Seven Ravens) Enjoy! Rated 5 out of 5 by JokerWilliam79 from Too awesome, shut up and take my money! I do not simply give 5 stars, but this game really blew my socks off. I only played 2 chapters off the game at the moment, but it already appealed to me, the first time that has ever happened to any Dark Parables games. It definitely worths a try. DP 9 for the win. I really liked the arts and voiceovers in the game, and also the puzzles. They are reasonably playable :) To all casual game lovers out there, this is a must-try. Rated 5 out of 5 by MysteryLover84 from Another Fantastic Game ^_^ I thought Dark Parables was finished after 'The Little Mermaid and the Purple Tide' with no 'preview' to the next chapter of the tale. Another great game with it's epic storyline, detailed graphics n extras in the gameplay. 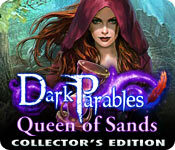 Rated 4 out of 5 by tbbquilts from Dark Parables: Queen of Sands CE based on full game normally play without sound enjoyed this game; the graphics were very nice. there is a lot of chasing around; however, using the map will keep you going forward. if you do not use it, you will get lost quickly. only had to refer to the strategy guide a few times. wish the developers would give us more information about the special items we are to collect along the way, especially if there is more than one collection. Rated 4 out of 5 by kazooie2628 from A step in the right direction Many DP fans are still reeling from Purple Tide, which I agree was a very poor show by Eipix and BlueTea. However, in Queen of Sands, we see that some of the issues in the previous game have been answered. First of all, the minigames are much more varied this time, rather than a simple rehash of the same 3 minigames like in Purple Tide. Second, the landscapes and FROG scenes seem to have regained at least part of their BlueTea feel, which was sorely missed in Purple Tide. Finally, while the opening cinematic was cartoonish to the point that it may turn away some DP fans, they do get better as they go along, coupled with the beautiful character designs DP fans have come to expect. Now for the negatives. While it's true that the game is certainly better than Purple Tide, it suffers from some of the same problems. Namely, for me, the biggest issue is a confusing storyline that deviates so drastically from it's fairy tale inspiration that there were points when I was asking myself "wait...is this supposed to be Beauty and the Beast?" It almost seemed like the Beauty and the Beast aspect was forced to fit the storyline, instead of the other way around. While some may blame this on Eipix, the newcomer to the DP franchise, I feel that this lack of connection to the subject material really started out in Ballad of Rapunzel, where almost no mention was made at all to the titular character's famous hair, despite it featuring prominently in the title screen and title card. The connection to other DP games is also rather weak in Queen of Sands. Yes, the Red Riding Hood sisters are there, but that seems to be the only connecting point, sort of like how Pinocchio showed up in Purple Tide. In short, I think the story is where this installment suffers the most, and that's a real shame. Part of the thrill of DP games is their fairy tale stories, but here it feels like it's been tacked on at the last moment. There are also a few plot holes that never really get shored up. Other than that, I think this game is a big step forward from Purple Tide, improving in almost every area. Also, unlike Purple Tide, which had bugs and issues from the get-go, Queen of Sands seems to have a much better track record for being user friendly. I would recommend this game for DP fans and newcomers alike. Rated 4 out of 5 by konpekikitsune from Dark Parables Back on Track? With the addition of Elpix to the Dark Parables series a lot of the series' defining features were lost in Purple Tide, but QoS seemed to bring some of those back. While still vastly different from the previous DP games after playing the demo I was pleasantly optimistic about QoS. While it's not perfect, its definitely an improvement from Purple Tide, feeling much more like a Dark Parables game and I hope to see the next game continue this trend.